Usually considered stretch glass, but since this pattern often shows up in Carnival auctions, I've included it here. While Rib Optic is the nominal name collectors use, it was listed as #220 ice tea set in Fenton's production during 1921 and 1922. 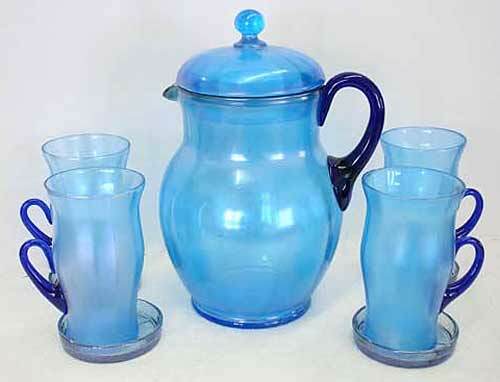 This celeste blue 5-piece set with coasters sold in 2006 for $375. The coasters, by the way, were usually a blue to match the handles. Photo courtesy Seeck Auctions. In 2013, a vaseline pitcher with a cobalt handle and no lid sold for $80. This set, also in celeste blue but without coasters, sold in 2011 for $160. Note the difference in shapes of the tumblers. Photo courtesy Seeck Auctions. 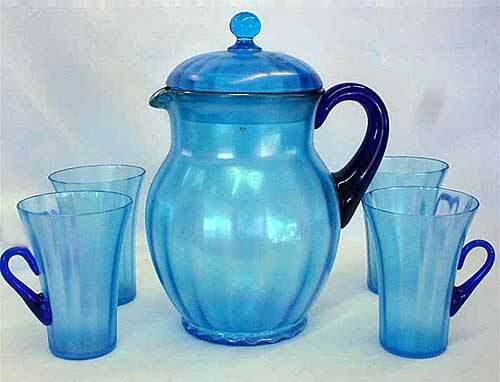 In 2013, a similar set, but with no lid for the pitcher (and five glasses) sold for $150. This creamer and sugar set in teal sold in 2013 for $450. A set in red sold at the same auction for $175.